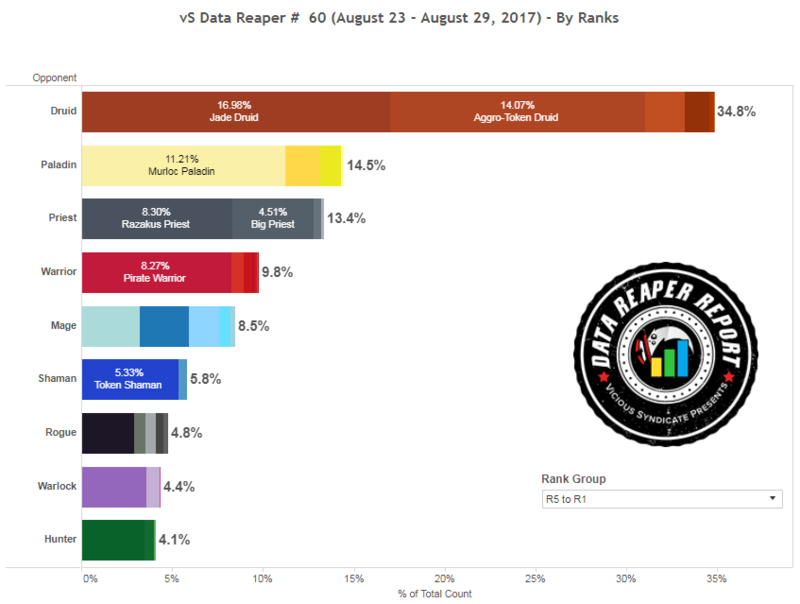 Welcome to the 60th edition of the Data Reaper Report! Malfurion the Pestilent has infested ladder with groaning green men and flappy birds. The Druid class is showing no signs of stopping, and has surpassed the number of Shamans at the peak of MSG’s Shamanstone. 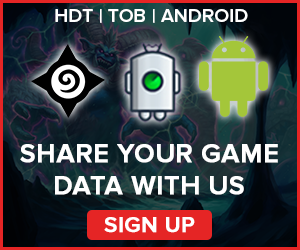 Jade Druid and Aggro-Token Druid are the two decks showing a spike in their popularity, while Mid-Token and Ramp are in decline. At legend, both Jade Druid and Aggro-Token Druid are more popular than any other class in the game. At top legend, it’s a common occurrence to run into an endless amount of Druids. The meta has been locked into a feedback loop and we doubt there’s a way out unless cards are changed. The circle of life… is over. 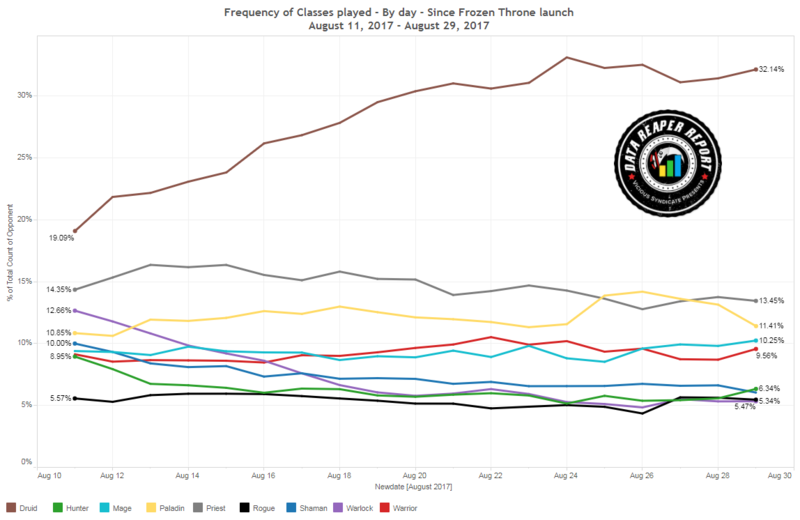 The second most popular class in the game, Priest, has declined in play. Razakus Priest has been overplayed on ladder considering its performance against the field, so we’re not surprised to see it take a small step back as it is still in the process of refinement. At legend, the deck is more advanced in its development, so its numbers have remained quite steady. Big Priest, on the other hand, has seen an uptick in play across all levels. Warrior and Paladin continue to be carried by their tribal aggressive decks, Pirate Warrior and Murloc Paladin. Most other archetypes for these classes are showing little signs of life. The one exception to that is Handbuff Paladin, which has increased in play and surpassed 1% of the meta overall. Thanks, Kibler. The class that has undergone the biggest transformation this week is Mage. Control Mage has spiked in popularity, especially at legend ranks, on the back of innovations in the archetype and a transition from burn-centric builds to fatigue-centric builds led by Purple. This is a highly diverse archetype that is still developing, so we’re interested to see how it settles down. Other Mage decks are currently taking a backseat to Control Mage in terms of play rates. Shaman, Rogue, Hunter and Warlock have all declined in play and are the least played classes in the game by a fair margin. All of these classes suffer from a lack of diversity, being dominated by one archetype, and we’re seeing very little play of anything else they could be offering. 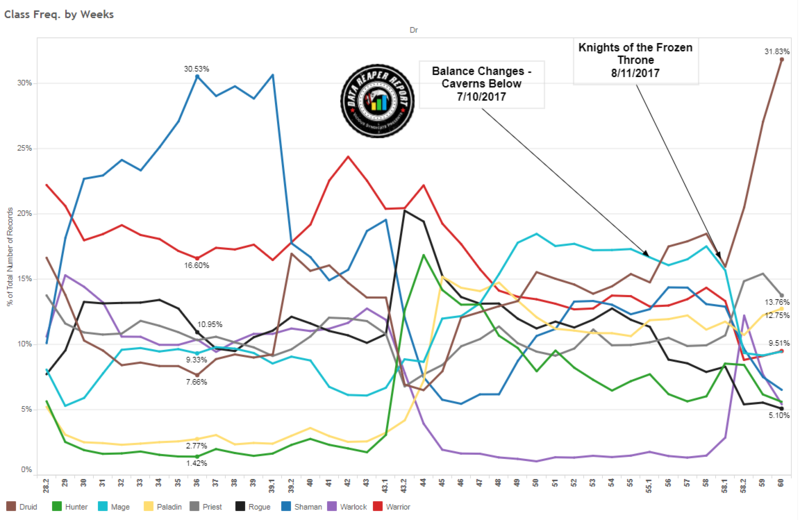 We can observe an overall decline in win rates for the top meta decks. With the meta becoming less experimental, and the most successful archetypes becoming more popular, the field is more competitive, leading to a deflation in the win rates of the popular decks. The most interesting development is Aggro-Token Druid’s decline in score at legend. The archetype seems to have suffered in its performance against the field as a result of being flocked towards, as it is the only reliable counter to Jade Druid (Though we do notice that Pirate Warrior is beginning to gain a few percentages on Jade Druid). Murloc Paladin continues to exhibit a drop-off in legend, separating it from the top three to some degree, but once again, these are the only archetypes with a positive win rate at legend. What do they have in common? They don’t have a negative win rate against Jade Druid, which continues to be the driving force of the KFT meta. It starts and ends with the groaning green men. As we’ve expected last week, Razakus Priest is showing an improvement in its score at all levels of play, and its win rate is getting closer to the 50% mark as it continues to be perfected. The cycle heavy build pioneered by RDU is more popular at legend, which translates into an improved performance at higher levels of play. It remains unlikely, however, that Razakus’ win rate on ladder will become top tier, since Jade Druid’s overbearing presence is suppressing its potential to a significant extent. The tournament scene is a different story, where Razakus Priest is the second most valued archetype. The ability to ban Druid while teching to beat aggressive decks (especially Pirate Warrior) puts Priest in a strong spot in theory, as it has a decent matchup spread against all of the other top meta decks and is quite difficult to effectively target. Let’s talk about the most improved archetype in the game. Control Mage has jumped in its performance to an extent where we had to reset its score. Considering its stage in development, it should continue to improve, which means its current matchup spread is not indicative of its potential. If Control Mage continues this upward trajectory, it may become a viable player in the current meta, with the Fatigue/Frost Lich Jaina build looking fairly promising. Token Shaman and Secret Mage share similar stories. 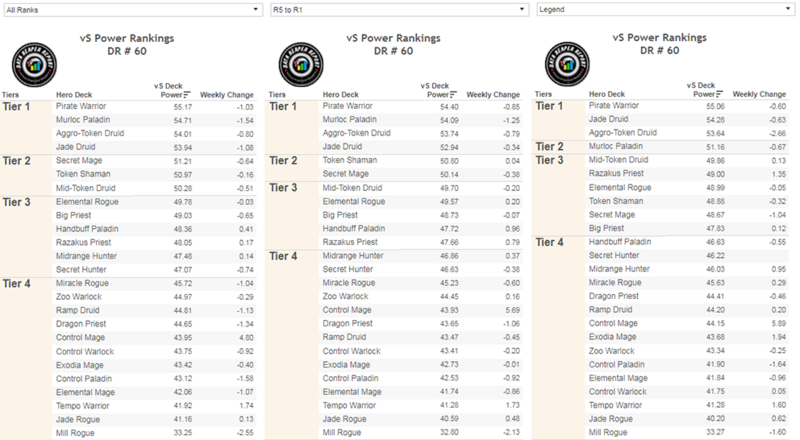 They both perform better at lower levels of play, where the meta is more forgiving, but hit a wall when they encounter the top meta decks on a regular basis. Secret Mage struggles to deal with other aggressive decks, while Token Shaman is suffering from the introduction of Spreading Plague, perhaps more than any other deck in the game. Another case of “close but no cigar” is Mid-Token Druid. It’s a strong Druid deck, but not nearly as strong as Jade and Aggro-Token, which explains why it has fallen off in popularity as a result of redundancy. The possible hidden gem of the KFT meta is Elemental Rogue. It’s been performing well since the beginning of the expansion and we maintain it merits more exploration. We cannot tell how it would perform if it spiked in popularity, since judging by past experiences, the increased usage could lead it to sink or swim. It certainly should receive a closer look, though, as it is the only Rogue archetype that is holding its weight in the current meta. Miracle Rogue is mostly failing, save for the heroic tales of a few individuals. 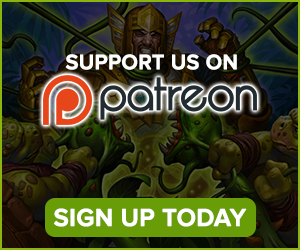 The rest of the meta looks to be in poor shape and we’re wondering if more break-out builds could emerge from underperforming archetypes, as in the case of Control Mage. Could other control decks, such as Paladin and Warrior, find a consistent fatigue focused build that runs Skulking Geist? Can Handbuff Paladin, which is already looking to be a playable archetype, get better? Can Hunter get out of its rut? Is there any hope for Warlock at all? Time will tell. Druid, for the most part, has settled into two major archetypes; Jade Druid, and Aggro-Token Druid. 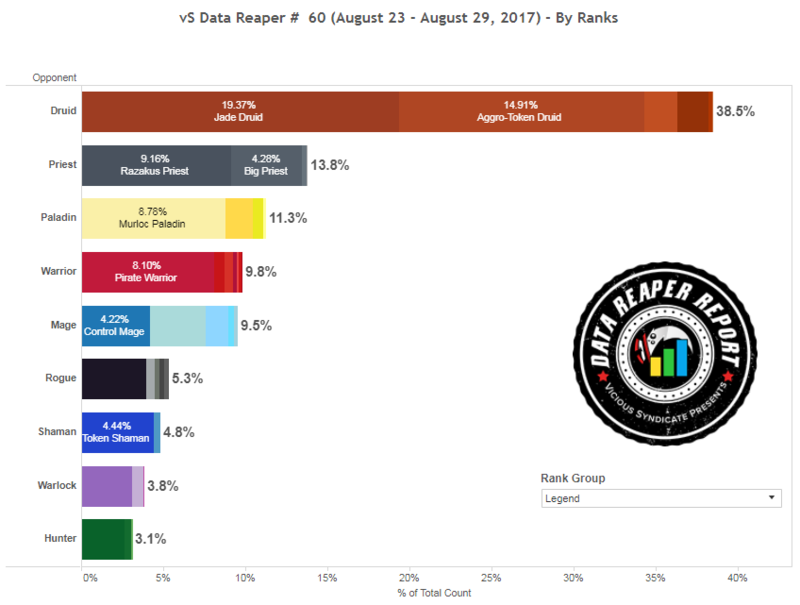 The class continues to dominate higher levels of play, with nearly 40% representation at legend and likely a higher number at the top legend ranks. Both Jade and Aggro-Token Druid have found what seems to be working for them fairly quickly, since both archetypes had a solid base to go off of from the last expansion. The Jade Druid mirror seems to be a ridiculously common theme in the expansion, and as such, Mind Control Tech is finding its way to many lists. At the top legend ranks, players are trying to gain an edge in the mirror by dropping the AOE defensive cards, Spreading Plague and Primordial Drake (subsequently dropping The Black Knight), while adding more value through Medivh. Two Mire Keepers are also becoming common, solely focused on ramping to 10 mana and dropping Ultimate Infestation first. Unless you’re running into the mirror match every other game, the aforementioned defensive tools are quite important in order to stabilize against aggression. Kun the Forgotten King is another fairly popular choice and often competes with Medivh for its slot, offering immediate tempo rather than long term value. Finally, Doomsayers are a common tech choice if you’re interested in improving your win rate against aggressive decks further. As one of, if not the only, deck with a favorable matchup against Jade Druid, Aggro-Token Druid has risen up in its play rate. Druid of the Swarm and Crypt Lord seem to be staples in the archetype, with many people opting to run Crazed Alchemists to turn the huge taunts into a burst of damage for a finishing blow. Crazed Alchemist also helps get through taunts with high health and low attack, and one shots Doomsayer, a fairly popular card in the current meta. Midrange Token Druid hasn’t been seeing too much play, as many people agree that Jade is the superior choice between the two. This archetype, in theory, has multiple win conditions, with its ability to snowball early boards, and even out-value many decks with UI. However, a deck that is the jack of all trades often falls short at achieving either of its win conditions, lacking the finishing punch to end the game early due to the deck not running Savage Roar, or running out of threats against a greedier deck. EZ BIG EZ DRUID EZ is back to its meme status. The deck is a lot of fun but lacks the consistency that Jade Druid offers. In addition, with Jade Druid commonly running tech cards for big threats, Ramp Druid’s matchup against it is not as good as it used to be before the launch of KFT. Druid is an issue for Priest. More accurately, Druid is an issue for everyone, so if you are not playing Druid, you should be playing things that at least stand a chance against Druid while also having decent matchups against the field. Priest is not a bad choice in that regard. Big Priest has been seeing more play over the past week. Its high roll capability mixed with Priest’s early game removal has led it to be a viable choice at the end of the ladder season. Razakus Priest is still the flagship archetype in the Priest arsenal, and its most popular builds focus on the addition of cycle cards to ensure that you can get to burning down your opponents with your free hero powers as soon as possible. Findan has recently hit #1 legend with his take on the heavy cycle variant. Both archetypes have close matchups with Aggro-Token Druid, but Big Priest fares better in the matchup against Jade Druid as well as the mirror due to its ability to blow out the game on turns 4 to 6. Razakus’ advantage is its performance against aggressive decks. This advantage can be further improved with the addition of tech, something that Big Priest is less flexible with. Dragon Priest is still seeing some experimentation, but has failed to gain traction. It just doesn’t keep up with the other tempo decks, and can’t pack the punch needed to consistently get past Druids, as they stabilize far too easily now. All in all, Priest is in a strong spot relative to the field, and if a change were to come to Druid, there is actually a chance it could become one of, if not the strongest, class in the game. 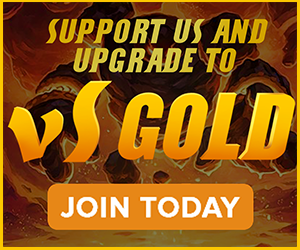 The meta is mostly mrrggl for Paladin this week as Murloc Paladin is proving itself to be one of the strongest decks in the game and is seeing a healthy amount of experimentation to support the tribal core. Mitsuhide peaked at #14 legend this week, slightly modifying his build by adding Stormwatcher in order to fully capitalize on Corpsetaker’s ability. The Czech Republic even ran two Stormwatchers in the finals of the Hearthstone Global Games (which you probably shouldn’t do!). Aclon hit #1 legend using a Chum list that goes as far as running Chillwind Yeti, increasing the archetype’s meme value by a significant margin. Once again, probably not the optimal choice. Control Paladin is not performing well in this meta, but players are continuing to experiment in order to try and make it work in a very hostile environment. Kito hit #21 legend with a list featuring Righteous Protectors, while Weghuz reached top 200 with a Curator package that includes Golakka Crawlers. The latter also runs Skulking Geist, for a better chance at dealing with Jade Druids. Handbuff Paladin has eclipsed 1% representation at all ranks. Kibler’s OG Keleseth Handbuff list remains the standard build, although builds that run Grimestreet Outfitter do see play. The argument for Kibler’s build is that it runs generally good cards that do not rely on being buffed in order to be good, contrary to cards such as Doppelgangster. This makes it less likely that the deck will fall on its own face when it doesn’t draw the cards it needs in the correct order. Warrior remains in the leading pack of the meta in terms of power level, but at this point, it’s entirely down to Pirate Warrior. Pirate Warrior makes up the lion’s share of Warrior decks on ladder, and is responsible for the vast majority of the class’ successes. It continues to have one of the highest win rates of any deck in the game. Interestingly, Pirate Warrior’s matchups against Token Druid and Token Shaman have improved significantly from the days of Un’Goro, when they were extremely difficult. The matchup with Token Shaman has improved due to Bittertide Hydra, with which Shaman struggles to deal, establishing itself as a staple, as well as Shaman builds trying to get greedier in order to improve the matchup against Jade Druid. In the case of Druid, Golakka Crawler is less common in Aggro-Token lists, reducing the number of auto-wins Token Druid got by eating up a big Pirate. Pirate Warrior’s standard list remains largely the same. Two Spellbreaker builds are also fairly common, with Ender hitting #5 with a list that also includes Forge of Souls. It’s bleak for other Warrior archetypes. None of them have gotten anywhere in the past week and while they remain around, most of them have a Jade Druid matchup so bad that they’re not worth playing. Until Jade Druid is nerfed, it’ll be a rough time for the more lawful members of the Warrior class. 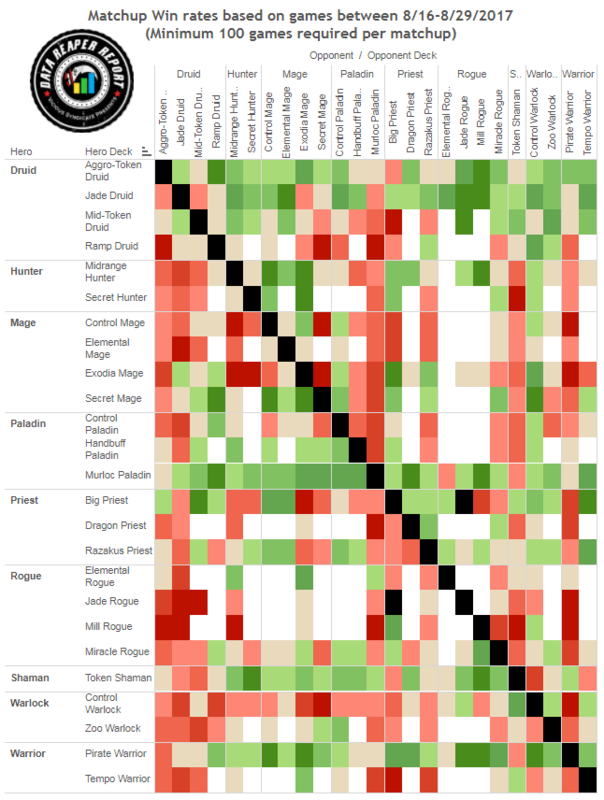 The Mage class appears rather divided with a range of archetypes in existence but none are especially prevalent in comparison to Mage decks of past metas. Rororollll reached Top 50 legend with an Exodia Mage build including extra stall with Cone of Cold joining Ghastly Conjurer alongside the typical Frost Novas and Blizzards. When building the deck one must look for a balance between draw for Quest completion, alongside stall to survive until the OTK combo is drawn, as well as cards to generate spells to complete the Quest. Correctly balancing these 3 requirements is tough, which makes the archetype fairly inconsistent. When playing against aggressive decks, it is often correct to use combo pieces, such as the Sorcerers Apprentice’s, as opposed to hoarding them for an OTK that will never come in time. Control Mage has risen in play this week on the back of some innovations focusing on a heavy-removal, fatigue oriented build. Purple hit #10 legend with a list based around the value of Frost Lich Jaina. Skulking Geist and the plethora of single target removals allow the Mage to run the Jade Druid out of resources. Zalae followed that up with a #7 legend peak, cutting Coldlight Oracles for a Bloodmage Thalnos and an extra Fireball. 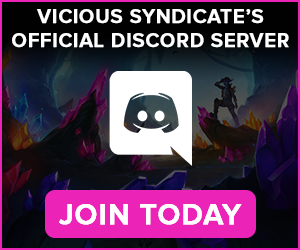 There are many other options and tech choices available for the deck, such as Acolyte of Pain, Pyros, Gluttonous Ooze, Volcanic Potion, 2nd Flamestrike or even Baron Geddon. 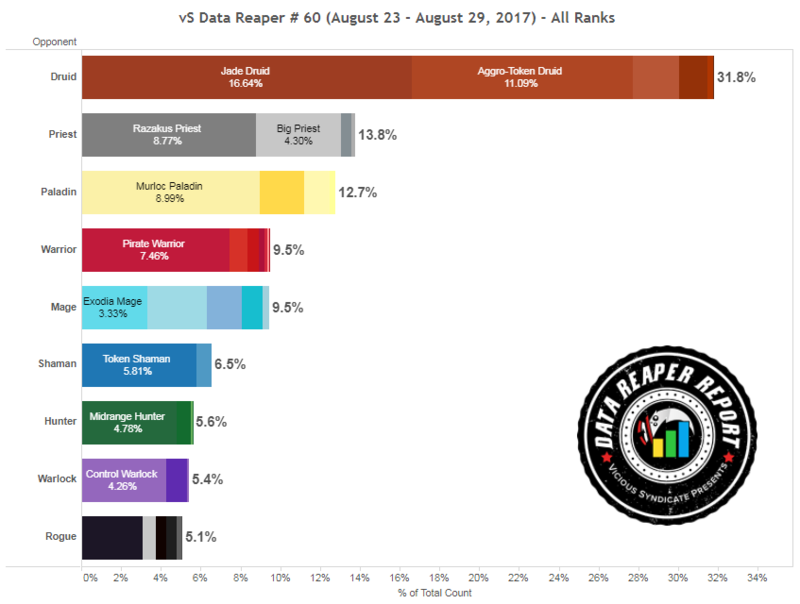 Secret Mage currently holds the highest win rate of all Mage archetypes, with Vorder hitting top 50 legend with the archetype this week. Bonemare is becoming a more common choice for Secret Mage, and is a value/tempo bomb that is comparable to Firelands Portal, provided you have a minion on the board. Water Elementals shore up the build’s turn 4, though there is an option to drop one of them for Archmage Antonidas in order to improve the matchup against slower decks (such as Priest). Mirror Entity and Counterspell make up the secret package but as always these are flexible spots to suit the meta. For example, if you are facing a lot of Paladins, Spellbender is often stronger than Mirror Entity, while Ice Block allows you to sometimes race for lethal in other aggressive matchups, such as Pirate Warrior. Shaman continues to exhibit a decent power level, though it is one dimensional and overshadowed currently by the Druid class. The bulk of the class’ usage comes from its flagship deck from Un’Goro: Token Shaman. Slower Shaman archetypes are stifled by the existence of Jade Druid on ladder. Until Jade Druid is nerfed, Control and Elemental Shaman decks will continue to see very little play. Token Shaman was a late bloomer in Un’Goro, but turned into a powerhouse that was only consistently beaten by Freeze Mage and Taunt Warrior to a lesser extent. Now, we see the deck fill a middling role in the current meta. While it is favored against the tribal aggressive decks of Murloc Paladin and Pirate Warrior, it has a more difficult time against Druid and Priest. The archetype continued to see very little innovation this week, with two copies of Devolve being quite important at the moment. We’ve seen top legend lists running Jade Spirit instead of Saronite Chain Gang, and others running Bonemare instead of Doppelgangster, but there is nothing groundbreaking or more consistent than the standard shell. Rogue is quietly suffering in Knights of the Frozen Throne. The class has the lowest representation across all ranks, and even though it is seen more at legend and is certainly not in as a difficult spot as Warlock or Hunter, things still look grim for the class. There is little innovation going on for Rogue outside of Miracle Rogue. Vanish is becoming a more popular card in Miracle Rogue alongside Valeera the Hollow. Vanish is an excellent tool in punishing decks that flood the board, especially as a follow up to Valeera. Mr. Yagut, one of the most accomplished Rogue players, piloted his Vanish build to top 30 legend. One option for Rogue is to go for a more aggressive route. Asmodai built a tempo-oriented deck that utilizes Prince Keleseth. The 2-mana Prince is also used in Elemental Rogue decks, which look very promising but have yet to gain traction on ladder. Corbett’s list is one of the original builds for the archetypes through which other iterations were developed. What started as hope for the Warlock class has quickly turned to despair. As of right now, Warlock is the second-least represented class on ladder, and that’s true regardless of whether we look at legend or rank 15. Both Control Warlock and Zoolock have proven to be inferior compared to options other classes provide. Zoo is being out-Zoo’d by decks that can vomit a mountain of stats on the board with which the Warlock simply cannot compete. Control Warlock decks can’t pressure Jade Druid consistently, and have a difficulty juggling value and defensive tools. Barring an epiphany from a talented deck builder or some pretty significant balance changes, Warlock’s return to playability looks to be over until the next expansion. Hunter is stuck once again in a limbo of being so lackluster, so one-dimensional and so lacking in any glimmer of potential that players aren’t trying to refine the class, causing it to look even worse than it probably is. With so many Druids inhabiting the top end of ladder, it is no wonder that Hunter struggles so badly, having the lowest representation at higher levels of play. Hunter might not be a serious contender in the meta for another four months, as even a round of balance changes will not shore up Hunter’s primary weaknesses. It’s a class stuck in a very linear style of play with almost no versatility whatsoever. If you do want to play Hunter, the class remains fundamentally good for beginners, but it should not be taken past rank 5 unless you seriously love Hunter, or alternatively, seriously love suffering. Expect the class to continue to fade away, mirroring its gradual decline during Un’Goro, and heading deeper towards the bottom of the meta. “Corbett’s Elemental Rogue” leads to “Page not found.” Where is the list at? Thank you for all your amazing work. You guys helped me get first time legend. I find your articles about the weekly shape of the game very accurate.